Aaron Fernando: It is common to see questionable policies enacted by state and local governments under the guise of economic development — policies which appear to serve the interests of private entities rather than the interests of society at large. Yet at the other end of the spectrum, real and sustainable sources of wealth, along with the many non-financial elements crucial to the health of societies, continue to be generated by individuals and small-scale producers, largely without much assistance from local governments. 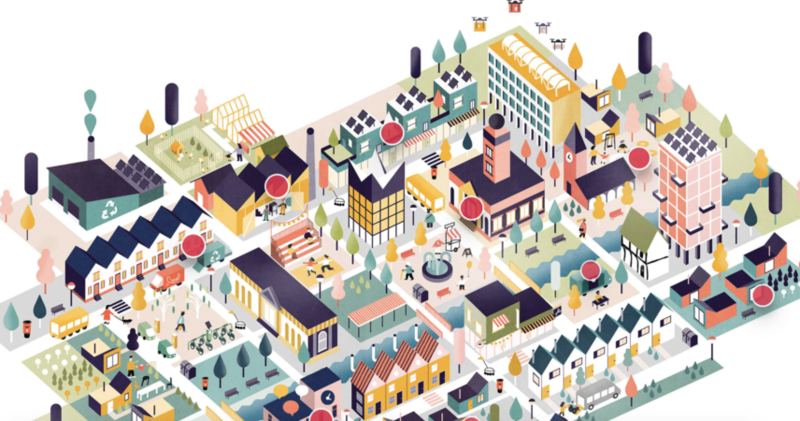 Recently, the U.K.-based foundation Nesta released an interactive visualization called ShareTown, intended to help people think about what it might look like if local governments used technology and focused on both small-scale local organizations and individuals in creating positive social outcomes within a locality. Described as “an unashamedly positive vision of a preferred future in which interactions between citizens and local government are balanced and collaborative, and data and digital platforms are deployed for public benefit rather than private gain” ShareTown allows visitors to click around and explore an interrelated set of organizations, institutions, and individuals in one vision of a prosperous local economy of the future. These organizations include a makerspace, a community waste and re-use center, a childcare cooperative, a mobile library and resource center, and many others — all in some way utilizing technology and supported (financially or otherwise) by local government. The ideas in ShareTown were derived from a workshop in May 2018 with leaders from local governments and members of the public, and discussed in light of drastic budget cuts faced by local governments around the U.K. Although ShareTown is U.K.-specific and offers links to “Reference Points,” which are existing projects, similar projects have already been sprouting up around the world. For instance, ShareTown contains a platform co-op which links freelancers with resources and protections against certain types of risks. The cooperative SMart is mentioned ShareTown, but others around the world like the Freelancer’s Union in New York City, New York, operate similarly. However it is noted that “ShareTown is not intended as a prediction, but a source of inspiration — and provocation.” ShareTown was created by Nesta’s ShareLab, which has “a mission to grow evidence and understanding of how collaborative digital platforms can deliver social impact.” Thus, explicit in this approach is the belief that data collection and specific technological tracking and monitoring solutions will lead to positive social outcomes. This includes certain initiatives with potentially uncomfortable data-gathering, such as a mobile library operated with a mix of public and private funding which also tracks user outcomes. In light of recent, serious data breaches like those of Marriott and Equifax, along with the reality that digital platforms and big data have been utilized by the few to manipulate the many, this technological optimism is indeed a provocation and something to be discussed. ShareTown provides a thought-provoking angle with which to think about the role of government and technology in maintaining a healthy local economy, and can be thought of in tandem with frameworks such as the Cleveland Model and the Preston Model. These two models in particular illustrate flows of money, time, and other resources between institutions and organizations without focusing on the usage of technology. Taken together, these frameworks can help both local residents and public officials think about and reframe how a locality achieves economic resilience even with limited resources.